Volkswagen is displaying the potential of its flagship Golf R hatchback at the Auto China show in Beijing, in the muscular form of the Golf R 400 concept. If the ‘400’ in the name doesn’t give the game away that this is a seriously powerful machine, then the body and bumper modifications and flared wheelarches should give more than a hint. Based on the standard Golf R hatchback, which with its turbocharged 300 PS engine and 4MOTION four-wheel drive is hardly a shrinking violet, the Golf R 400 ups the ante considerably, with 400 PS and an extra 70 Nm of torque, making for 450 Nm in total, available from 2,400 to 6,000 rpm. Developed by Volkswagen R GmbH, the arm responsible for high-power and customisation projects, the Golf R 400 uses a modified version of the engine found in the Golf R: a 2.0-litre four-cylinder turbocharged engine (Type EA888). The extra power of the 400 helps propel this six-speed DSG-equipped model from rest to 62 mph in just 3.9 seconds, a whole second faster than its 300 PS sibling. Its top speed is 174 mph (governed). To achieve the increase in power, the Golf R 400 features a newly developed turbocharger with a higher maximum charge pressure and reinforced crankcase. A water-cooled exhaust gas feed to the turbocharger integrated in the cylinder head helps to reduce full-load fuel consumption, while variable valve control with dual camshaft adjustment improves economy and performance. At 1,420 kg, the Golf R 400 weighs the same as the standard Golf R, but its appearance has been substantially altered. The body is 20 mm wider on each side, with flared wheelarches that are reminiscent of those on the 1988 Rallye Golf G60. These arches, like most of the body, are painted in ‘Silver Flake’ metallic, and contrast with the gloss black roof and carbon door mirror caps. New sill extensions seamlessly bridge the gap between the widened arches. Filling those arches are 19-inch alloy wheels on an increased offset. A development of the Golf R’s standard ‘Cadiz’ wheels, these are highly modified, with high-gloss back inserts that act as air vanes, helping to cool the reinforced braking system. The tyres are 235/35 R19s. At the front, the bumper has been completely redesigned to take into account the greater cooling requirements of the R 400. A carbon fibre splitter and aerodynamic ‘wing element’ help to push air towards the honeycomb mesh of the grille – one of many aspects influenced by motorsport. 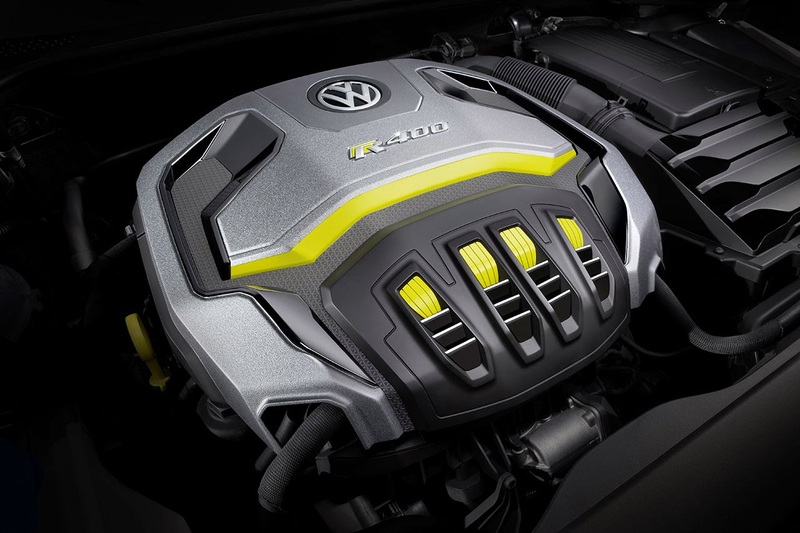 The ‘R’ badge on the gloss black radiator grille sits on a ‘Lemon Yellow’ background, while the horizontal stripe across the grille (which, like the chrome strip on the Golf R, continues into the bi-xenon headlights) is also ‘Lemon Yellow’. 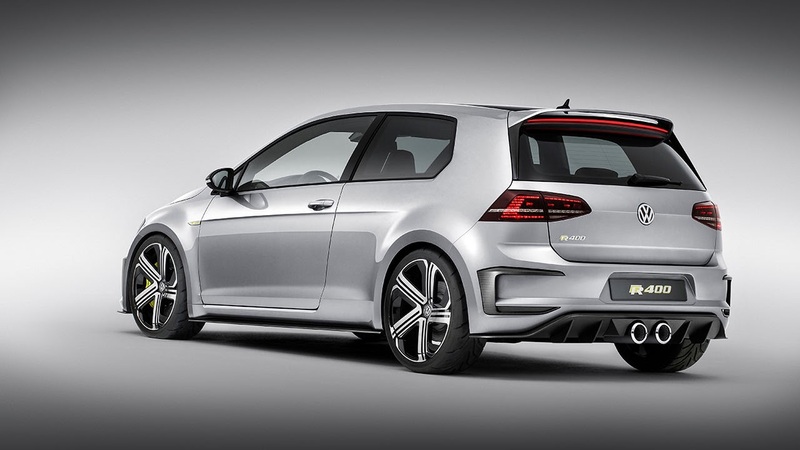 The redesigned rear bumper includes vents on each side, and the Golf R’s four tailpipes have been replaced with two centrally mounted items, like those on the 2002 Golf R32. These 110 mm diameter items are 200 mm apart, and point slightly upwards, displaying a honeycomb mesh. A black double spoiler with LED brake lights atop the tailgate finishes the look. Inside are motorsport shell seats with integrated head restraints and belt openings. 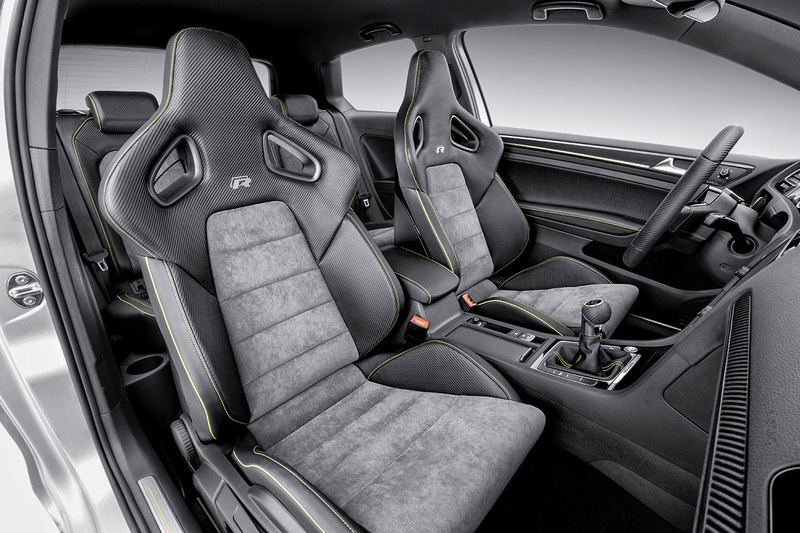 These are upholstered in cross-quilted panels covered in Alcantara, and ‘carbon leather’, as are the two individual rear seats. Stitching throughout the interior is in contrasting ‘Lemon Yellow’. 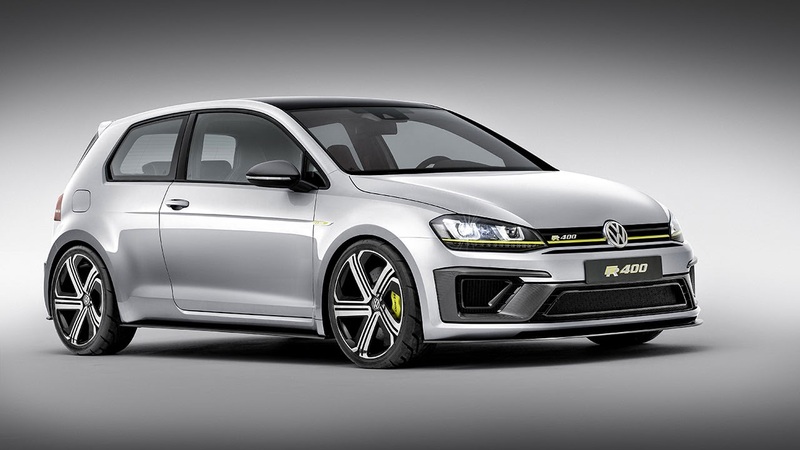 The Golf R 400 is only a concept at this stage, with no production plans.